For many students they don’t get to see their parents until the evening, but for a handful of students at BV West, they see their parents when they wake up, during the school day and after school. Not only do these kids attend BV West, so do their parents, who are teachers at BV West. Art teacher, Nicholas Tomasic, also known as Mr. T, joined the staff of BV West this year. 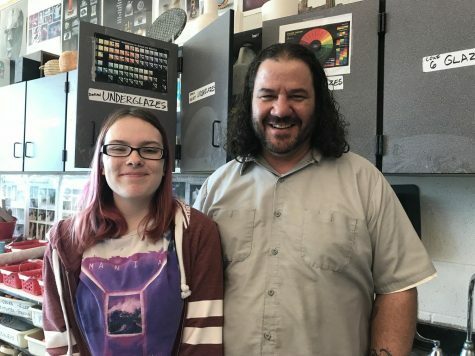 When he accepted the job offer, his daughter, freshman Marangely Tomasic, was set to go to another school until she toured BV West once to look at it. Most kids don’t get to see their parents until they come home but, Marangely gets to see her dad everyday.Whether it’s when he stops her in the halls before walking to band class, or when he scouts her out during JAG, they see each other almost everyday during the school hours. It means a lot to both Mr. T and Marangely that they not only have a familiar face in the school, but also a family member that they can go to if they need them. “It means that I always have some place to go if things get rough with friends, or if I just don’t have anything to do, I always have some place to go” Marangely said. Having someone in the same family as you at the same school can prove to have some identity problems, but Marangely and Mr. T don’t have that problem. Many students at BV West know Mr. T as he is a popular teacher among the students. Many people are aware of the family ties between Marangely and Mr. T, her dad. Marangely believes that she has better relationships with some of her teachers because her dad works at the same school she attends, not better grades. Mr. T and Marangely fit right into BV West and both are valued additions to the staff and student body. Another teacher with family at BV West is math teacher Lisa Bandre. 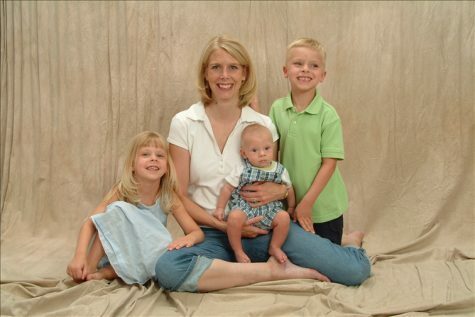 She has two kids that attend BV West, sophomore Kate Bandre and senior Trent Bandre. Mrs. Bandre has been teaching at BV West for four years, so she has been here ever since Trent and Kate started high school. She initially hesitant to take the job because she knew that her kids would also be at BV West, but in the end, she accepted the job. Trent and Kate have differing opinions about having their mom teach at BV West, but ultimately they say it is an enjoyable feeling to know that she is there. While Trent felt at first it was weird having his mom work at his school, now it doesn’t faze him and it just feels like a normal school day. Kate on the other hand, enjoys the benefits that having here mom work here brings to her. “I know most people would think it’s weird to have a parent work at your school but I actually like it. It’s nice having someone to go to when I need a last minute study session before a math test, or a place to store bags and projects so I don’t have to carry around, and it’s nice to go into her room and grab a snack before practice” Kate said. Trent says that everyone he knows at BV West knows that his mom is Mrs. Bandre. Kate also says that most people know who her mom is, especially her friends, but people still come up to her everyday and ask if she is Mrs. Bandre’s daughter. Mrs. Bandre feels like she has a closer relationship with her kids because she works at BV West. She likes to be able to support her kids in their activities and support her students as well. She feels closer to them because she knows more about their friends and the things that they are involved in. When caught between being a parent and being a teacher, Mrs. Bandre tries to stay out of her parenting role when she is at work. While it might have been hard to adjust to, Mrs. Bandre, Trent, and Kate all enjoy each other’s company at BV West, as well as the help and support they give each other. Whether it’s a friend, or a family member, it’s always a good thing to have a familiar face that you can see when you are at school.